The Tributes, held every three years and considered by the association to be the “highest industry awards,” honored 47 winners from a field of more than 450 nominations on November 3, 2015. “Receiving such wonderful accolades from our peers just reinforces our commitment to delivering high-quality projects and exceptional service to our residents,” said Zocalo Principal Susan Maxwell. 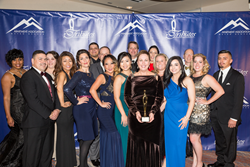 Zocalo Community Development was a big winner at the 2015 Apartment Association of Metro Denver’s 2015 Tributes ceremony. A finalist in six categories, Zocalo took home three awards for sustainability, and excellence in leasing and management. 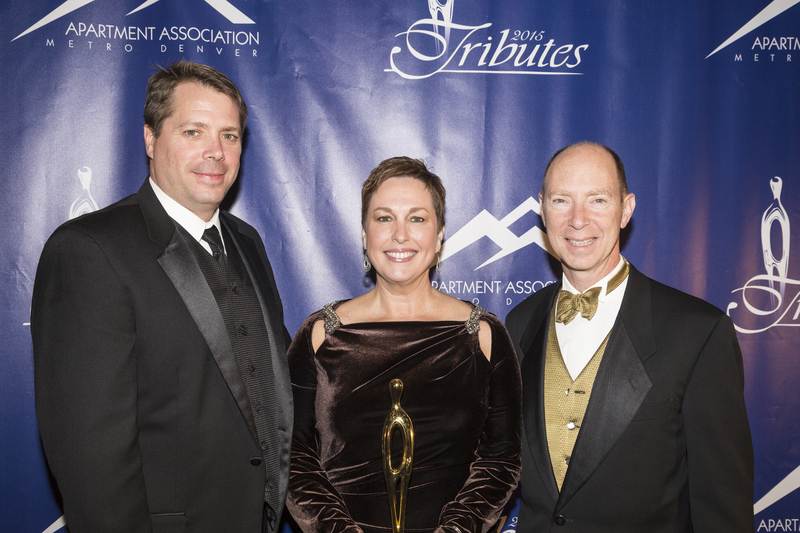 The Tributes, held every three years and considered by the association to be the “highest industry awards,” honored 47 winners from a field of more than 450 nominations on November 6, 2015. Zocalo’s 2020 Lawrence apartment building in Denver’s Arapahoe Square neighborhood earned the Tribute for Most Sustainable Community. The LEED Gold-Certified building, a past Mayor’s Design Award winner, was recognized not only for its sustainability initiatives, but also its impact on the surrounding environment and for involving residents in sustainability efforts. 2020 Lawrence residents actively participate in the community recycling program, the composting program and have access to free bike rentals. Each month, they are provided with statistics demonstrating their environmental impact. In May 2015, for example, residents conserved 19,310 gallons of water and saved enough electricity to power the average U.S. home for 1,032 days. “Years of thoughtful planning and design went into 2020 Lawrence. The execution of the vision for 2020 Lawrence transformed the site into an award-winning, vibrant community, which has raised the bar in sustainable apartment living in Denver,” said Zocalo Principal Susan Maxwell. 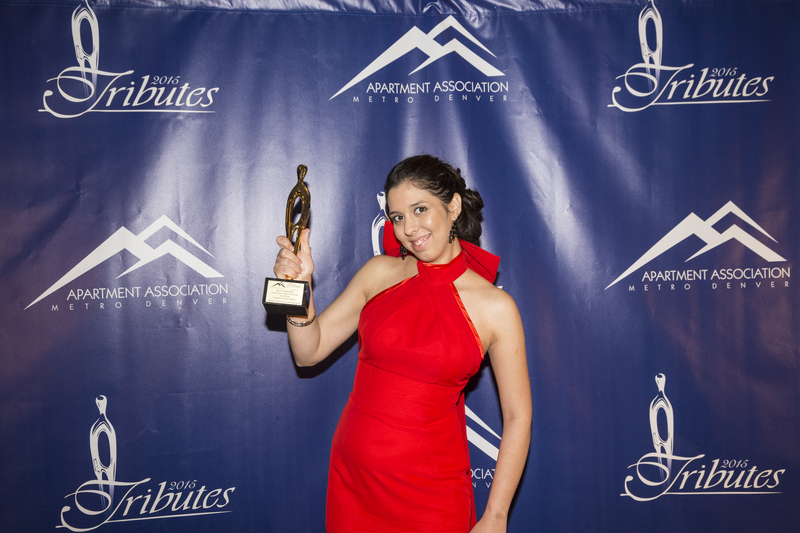 Irene Diaz, a leasing and marketing expert at Zocalo’s Cadence Union Station development, captured the AAMD’s Most Outstanding Leasing Professional award for properties with less than 350 units. Diaz was honored for her strong sales performance, exceptional professionalism and her keen ability to explain the benefits of LEED to guests and future residents. Residents have said that her enthusiasm and warm personality was a deciding factor in their selection of where to lease. “Irene brings endless talents to the multifamily industry and it’s a pleasure to work with such a driven and dedicated professional,” said Tamera Greene, Community Director for Cadence Union Station. Zocalo also received the Grand Tribute for Management Company – the highest level award of the evening. Recipients of this special award are selected by the AAMD rather than through the traditional nomination process. The Tribute for Management Company winner was chosen based on a formula that includes a variety of criteria including, the number of tributes awarded, the percentage of nominations that end up as finalists and the number of tributes in other categories. “Receiving such wonderful accolades from our peers just reinforces our commitment to delivering high-quality projects and exceptional service to our residents,” said Maxwell. Zocalo Community Development is an award-winning, Denver-based development and management services company focused on creating sustainable communities that deliver for residents, investors and neighborhoods alike. Locally produced and contextually sensitive are descriptors of Zocalo's commitment to community development. Zocalo seeks to reduce the impact residential and mixed-use buildings have on the earth and the environment by substantially reducing greenhouse gases generated both by the building itself and by the means and patterns of resident commuting. Zocalo is ceaseless in its commitment to improving the design, sustainability, construction, development and marketing of its projects. The product of this complete integration is the development of real estate projects of greater enduring quality and sustainability. The word Zocalo dates back to the Aztec culture and refers to a gathering place or center of town which is common throughout Latin America.